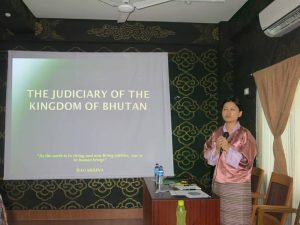 Bhutan Transparency Initiative’s (BTI) project “Advocacy and legal assistance program” (ALAP)’s objective is to translate the concerns of the citizens (those who have no access to justice, victims and witnesses of corruption) into structural changes for better local and national governance. The project will be implemented in a period of 24 months. The two-year project has already made tremendous progress during its first quarter of implementation. 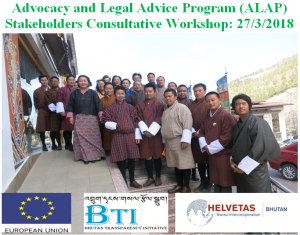 It has fielded 2 facilitators with legal background, one in the BTI Thimphu office and one in the ALAP center in Gelephu, Sarpang Dzongkhag. The major challenges BTI faces in delivering the outputs is the ability to bring on board desired individuals from different way of life. Being a program designed to address corruption through citizen participation, many were not forthcoming. The national election period also deterred several public consultations and meetings.